It is quite well known that Estonian medieval rural church structures are in poor condition. In cases of limited resources, an understanding of the underlying problems is important in managing the churches in the most sustainable way. Although the buildings are quite well investigated from the viewpoint of art history, there have not been many studies looking into the current physical state of these buildings. 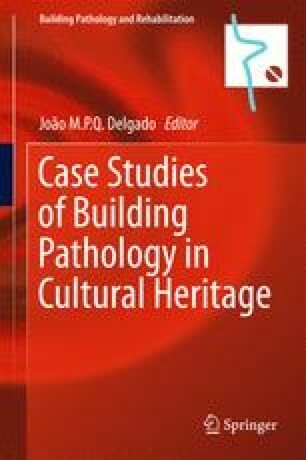 This chapter examines the physical condition of rural historic churches on the basis of 10 buildings in by visual inspection. The study covers most building parts. The description of the technical solutions is given, while most common and severe defects as well as their causes are revealed. The causes of deterioration are usually tied to the freeze–thaw damage mechanism and rainwater penetration. The root cause of this stems from lack of maintenance and funding. In many cases, repairs only dealt with the consequences and not necessarily with the causes. The study shows the urgent need for solutions for maintenance and indoor climate control. The authors are grateful to Simo Ilomets, Endrik Arumägi, Üllar Alev, Lembit Kurik, and Urve Kallavus from Tallinn University of Technology for the help in conducting the survey. The study has been conducted as part of the IUT1-15 project “Nearly-zero energy solutions and their implementation on deep renovation of buildings”. These data were gathered as a part of an international collaborative research project “Sustainable Management of Historic Rural Churches in the Baltic Sea Region” (SMC, http://smcproject.org.ee). The financial support of the Central Baltic Interreg IVA Programme 2007-2013 and Estonian Ministry of Education and Research are gratefully acknowledged.